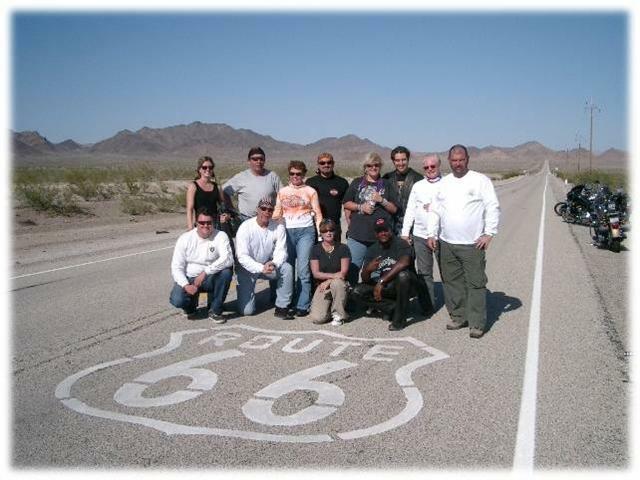 Ride Route 66 to the Grand Canyon from Los Angeles California on a Harley Davidson Motorcycle Guided Tour visiting Death Valley, Las Vegas, Zion, Big Bear, California on this motorbike adventure. Click the Picture Links Below and Gallery – These will show what Ride Free is truly all about. Check out the journey . Meet your fellow riders from around the globe and the Ride Free Tour Team late afternoon in the hotel lobby for introductions before we shuttle you a short distance to the pick up your bike! We take the bikes for a shake down cruise to our first group dinner at our favorite local spot at the beach. After dinner the Ride Free Tour Team will give a brief orientation and answer any questions about the exciting ride to come. Get a good night’s sleep, as we have a big week ahead. We wake up in California with our Harley-Davidson motorcycles familiar to us and waiting for us outside the hotel. The Ride Free Tour Team will give a safety briefing and answer any questions before we saddle up and hit the road. 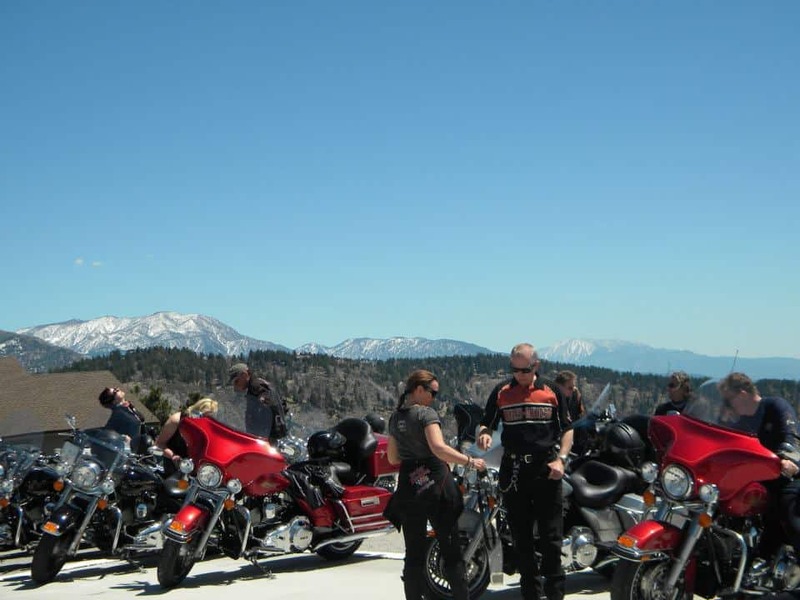 If you have never been part of a group ride on a Harley Davidson or touring bike before, you will find yourself grinning ear to ear as you realize that you have quickly become the object of envy for every pour soul stuck in their cars on the Los Angeles Freeway system. The only sound more satisfying than the roar of the engines of your fellow riders around you is the rumble of your own bike as you leave Los Angeles in your mirrors and the great American city gives way to lonely cacti and the inviting warmth of the California dessert. You have been waiting a long time for this day. Enjoy the feeling. After a lunch stop at a roadside diner we will open into the Nevada dessert before dropping down the valley towards the banks of the Colorado River and the small casino city of Laughlin, Nevada. After checking into the hotel, we’ll enjoy a group dinner before turning you lose to try your luck on the craps tables, slot machines and blackjack tables. Just remember to save few bucks because Las Vegas is just a few days away. For many, this is one of the most anticipated days on our journey, as we trace the path of American history along an open stretch of one of the world’s most infamous highways, Route 66. Feel the rumble of your bike as we open up our throttles and race back in time. You can almost see the old steam engine carrying passengers to a new life in the West along the 100 year old tracks that run parallel to Route 66. Gas stations and roadside diners still dot the same landscape that the first Harley Davidson motorcycles sped eastbound from Milwaukee so many years ago. We are now at one with the road as we leave a little piece of our own history on this great American highway. We will soon be leaving the roar of Route 66 for the quiet serenity of the most recognizable destination in the Southwestern U.S., Grand Canyon National Park. We will enter the Park and ride along the rim of the Grand Canyon at dusk as we make our way to the lodge for the evening. Once we settle in for the night we’ll enjoy a short walk to stand together in awe of one of the Great Wonders of the World. For those of you who want the full experience, we’ll organize an early morning walk to watch the sunrise over the Grand Canyon. You’ll have to see it to believe it. What an incredible day we have ahead of us! We’ll putt along the rim of the Grand Canyon once again as we make our way out of the Park for the scenic ride into the state of Utah on our way to Zion National Park. This region is rich in Native American history and we will have plenty of time to stop at road side stands and shop for Native American handcrafts or just to talk with people whose ancestors have called this area home for hundreds of years. These people are as proud and prominent as the great landscape that rises before us as we enter the visual wonder that is Zion. I’ll warn that you may forget all about the Grand Canyon once we enter Zion National Park. While Route 66 to Grand Canyon is easily the most anticipated day for our fellow riders, this is almost always the most memorable. It is difficult to paint a description of Zion that can measure up to the actual experience of riding through it so I will leave it to your imagination, except to say WOW. We will get an early start today so we can arrive in Las Vegas with plenty of time to cut loose. Leaving the cool air of Zion, we will drop down into The Valley of Fire, a moonscape of deep red clay earth and rock formations that open once again into the Nevada dessert. Here comes that ear to ear grin once again as Las Vegas starts to grow in the distance. 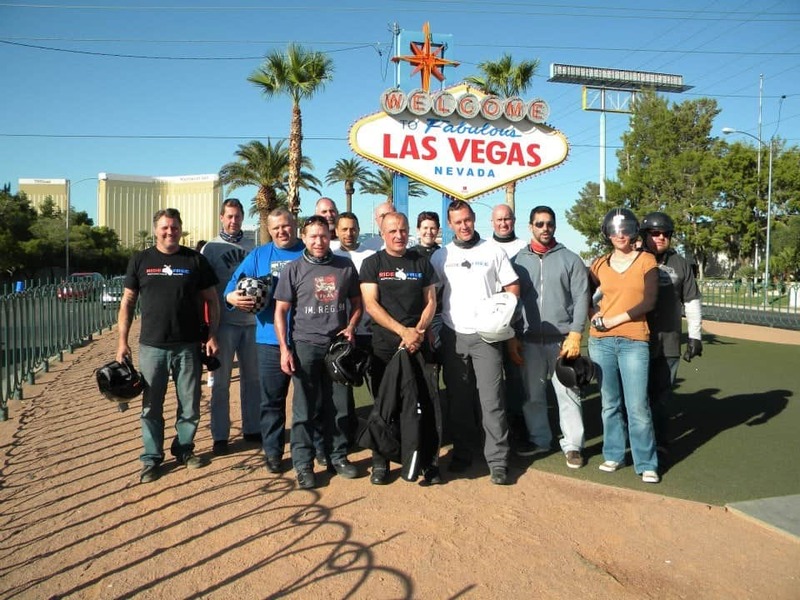 The only sensation that can come close to matching the wonder of the Las Vegas cityscape at night is cruising down the Las Vegas Strip amidst the rumble of your fellow riders and newfound friends as we make our presence clearly known. What happens next? That’s all up to you. Las Vegas is, well, Las Vegas. Walk the famed Las Vegas strip at night, take in an amazing show or redeem yourself at one of the great casinos. The choice is yours. We’ll organize a group dinner and some fun for those of you who want to come along. For the rest…Viva Las Vegas! Get up and shake off the glitter of Las Vegas because we are about to take a journey to one of the most unforgiving and magnificent places on the planet, Death Valley. It is going to be hot, but it will also be amazing as we enter the confines of Death Valley, one of the few habitable places on Earth that actually drops below sea level. Your Ride Free Tour Team will make plenty of stops to rehydrate and soak in the unbelievable sights. Our final destination for the day will be Panamint Springs, California, a tiny smattering of single floor hotel rooms over thirty miles from the nearest civilization that has been the backdrop for more than one Hollywood thriller. From the bright lights of Las Vegas to the bright stars of Panamint Springs. You have likely never seen the Milky Way and the constellations as clear in your life as you will tonight. As always, soak it in. Let it take over you. Home and work seem a million miles away and you hope this ride never ends. This day easily brings the greatest contrast in landscape of the trip, as we leave the vast expanse of Death Valley for the Sierra Nevada mountain range and the inviting waters of Big Bear Lake. Your bike now feels like part of your body as we climb out of the Valley and wind our way up through the dense forest of the Sierra Nevada. This is a fun ride! As we near our destination we will wind along the calm waters of Big Bear Lake, which doubles as a popular Southern California ski resort in the winter. Today it is sunny, warm and inviting. If you’re feeling adventurous join the few of the Ride Free Family in the past who have braved the icy waters of the lake for a late afternoon swim. Go ahead, we dare you! We still have a lot of adventure left. The Rim of the World is an amazing ride high in the mountains above the clouds. The last day of the trip is always accompanied by a swirl of emotions. You have become like family with your fellow riders and the Ride Free Tour Team, and you are wishing for just a few more days on the road. However, things start looking up again as we descend from Big Bear Lake and spot the Pacific Ocean on the horizon. We’ll drop down and run along California’s famous Pacific Coast Highway for a stretch through Malibu and along the Santa Monica Pier before turning inland towards our last stop. We will head to one of our favorite restaurants to enjoy one last meal together. This is one of our favorite times of each trip. Not because it is the end, but because we all get a chance to go around the table and talk about what we found special about the ride, the experience and, most importantly, the group. We love to hear, as is almost unanimously the case, that the Ride Free family far exceeded your expectations of what you would get out of this week on the road. We may even start planning the next year’s trip together over lunch We take one last walk on the beach, and turn our bikes in at the end of the day. 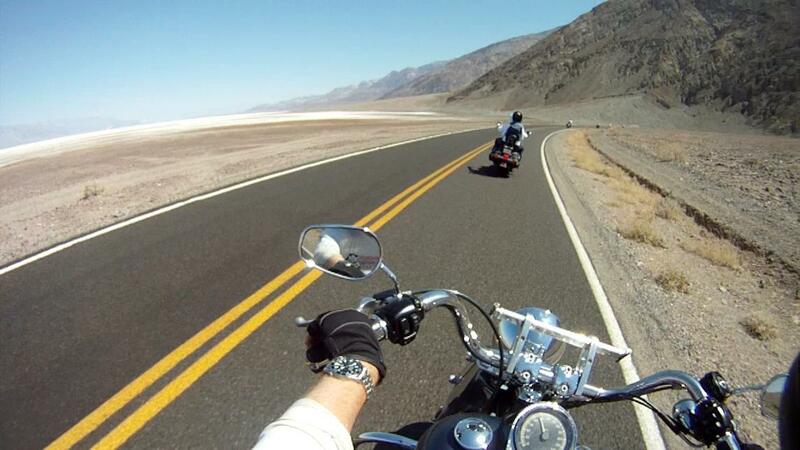 9 Day Option: We take our time riding our Harley Davidsons on California Rt 66 towards the Grand Canyon and stay at the bottom of the hill in Williams. This gives us a relaxing day exploring Route 66. 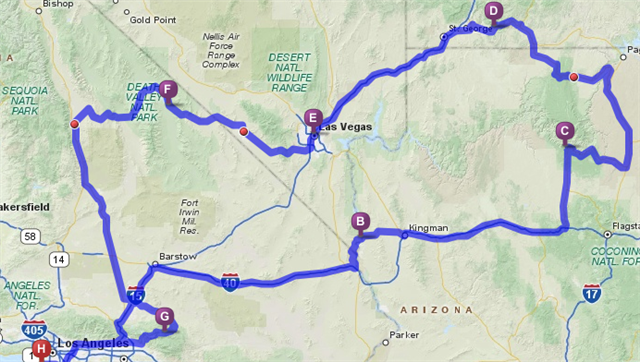 Then the extra day gives us an hour drive the next am from Williams on our motorcycles up to the Grand Canyon. We have all day to take a helicopter ride, go for a hike, and explore the canyon area before an amazing sunset. 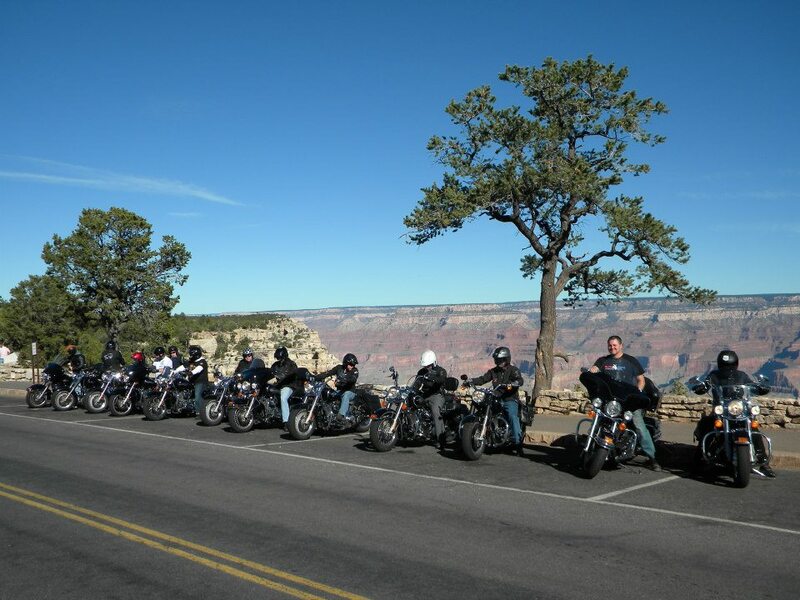 Or, for those wanting more riding, we can ride our motorcycles to Sedona for the day before riding up to the South Rim.